Merk Insights - Is the Yen Doomed? Because of Japan’s massive public debt burden, pundits have called for the demise of the Japanese yen for years. Are the yen’s fortunes finally changing? Our analysis shows that the days of the yen being perceived as a safe haven may soon be over. Let us elaborate. So many foreign exchange (“FX”) speculators have lost money shorting the yen that the currency earned the nickname the widow maker. Indeed, as the yen has had a weak patch as of late, some are already cautioning the trade might be crowded. But we don’t talk about a trade; we talk about a fundamental shift in the dynamics that might finally be unfolding. To understand the yen, consider the earthquakes that hit New Zealand and Japan in early 2011: New Zealand’s shaker caused the New Zealand dollar to fall; Japan’s earthquake, in contrast, pushed the yen higher. In the short-term, earthquakes disrupt economic growth; conventional wisdom suggests less growth leads to a weaker currency. However, economic growth and currencies do not correlate as highly as one might expect. Indeed, everything appears backwards in Japan, and there’s a reason: historically, Japan has enjoyed a current account surplus. As a result, Japan does not rely on inflows from abroad to finance its budget deficit. Despite conventional wisdom, note that when there’s a shock to the economy, consumers save more/spend less, a positive to a currency all else being equal (i.e., in the absence of a current account deficit). In contrast, countries like the United States, or New Zealand for that matter, have a current account deficit; in the absence of growth, foreigners are less inclined to invest in the country, potentially depriving the country of inflows needed to finance budget deficits and, in the process, putting downward pressure on the currency. One reason why U.S. policy makers favor growth over austerity is to encourage inflows to finance the deficit. On that note, the lack of growth in the Eurozone, where the current account is roughly in balance, may be bad for employment, but the euro has managed to hold up reasonably well despite the crisis. In some ways, when a country has a current account surplus, currency dynamics may be counter-intuitive: the more dysfunctional the Japanese government, the stronger the yen appears to have been in recent years. Since 2005, Japan has had seven prime ministers, with another change likely soon. A government with rotating heads suggests a government that doesn’t get anything done. Usually a government that “gets things done” is one that spends money, but Japan could not even get an expeditious rebuilding effort under way after the earthquake struck. With one of the world�s highest life expectancies, almost no net immigration and falling birth rates, Japan�s aging population is often cited as the key long-term driver of the country�s deteriorating current account balance. The Japanese retire later than others in developed countries, cushioning the impact somewhat. The main �achievement� after the earthquake was announcing to abandon nuclear energy. Increasingly relying on imported energy is bad news for Japan's current account balance. Rising tensions with China don't bode we'll for trade. Shinzo Abe, Japan's likely prime minister to be is said to potentially escalate tensions further. If correct, we expect Japan's current account balance to suffer as a result. Why does this all matter? After all, the US has had a massive current account deficit for years. The size of the current account deficit represents the amount foreigners need to buy in assets (local financial assets or real assets) to keep a currency from falling. With a current account deficit, Japan's debt to GDP ratio of over 200% may suddenly matter, as Japan may need to offer higher rates to attract foreigners to buy local assets (e.g., Japanese government bonds). 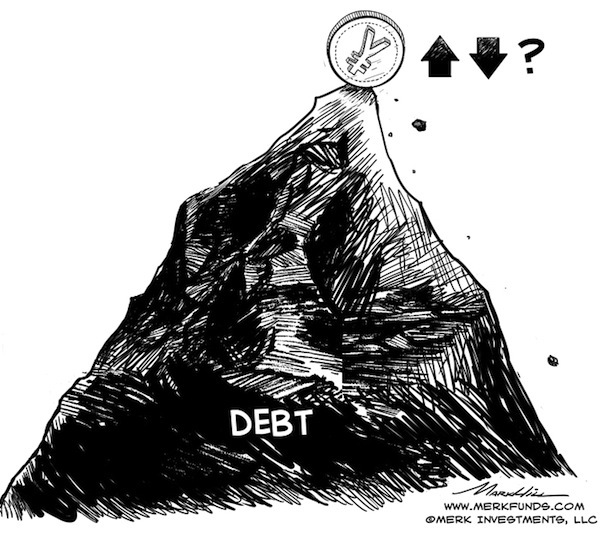 The trouble is that Japan’s debt might be unsustainable at higher interest rates. To the extent that Japan has a current account surplus, it doesn't matter whether foreigners buy the yen, but those surpluses have fallen to deficits recently and that trend looks set to continue. What the chart shows is that the yen isn't the safe haven it used to be. The yen no longer is the "go to" place when fear is elevated. 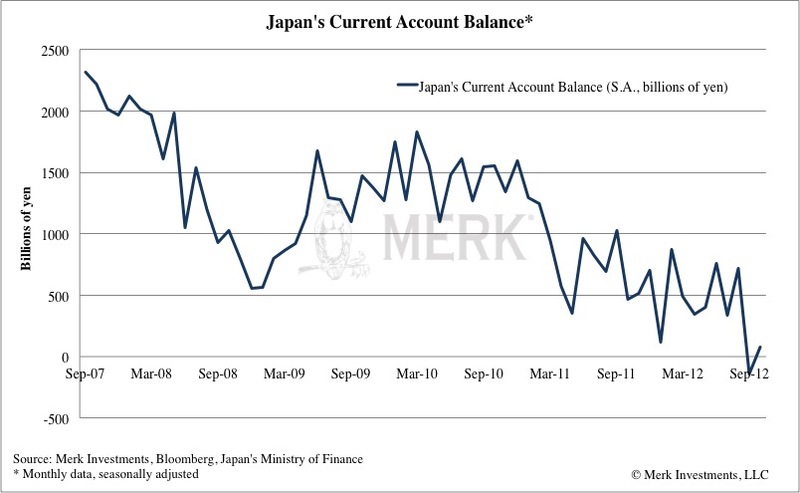 There might be many reasons for this, but we like to look at it in the context of the current account balance, shown in the previous chart: as the current account has deteriorated, the yen's safe haven status appears to be eroding. The one thing still going for the yen is that Japanese policy makers often don't execute on their talk. For example, Abe's election rhetoric suggests that the Bank of Japan (BOJ) will lose its independence as the government may force it to increase its inflation target of 1% (which it has failed to achieve) to 2 or 3 percent. But the BOJ has failed over and over again to live up to its promises. A side effect of that is that in recent years the BOJ's balance sheet has barely grown (the BOJ has "printed" very little money as one might colloquially say); Japan did its money printing in the 90s. However, it may matter little what the BOJ is up to once the current account deteriorates further. We don't look at these trends as academic exercises, but rather consider the risk of acting versus not acting. At this stage, we assess the risk of not acting to be high and are putting our money where our mouth is. We have a Webinar coming up on Thursday, December 13, 2012. Please register to learn more how we look at currencies to determine the strategic and tactical outlook for currencies such as the yen and the dollar. Please also sign up to our newsletter to be informed as we discuss global dynamics and their impact on currencies.